The national flag of Bangladesh (Bengali: বাংলাদেশের জাতীয় পতাকা) was adopted officially on 17 January 1972. It is based on a similar flag used during the Bangladesh Liberation War of 1971. The map was later deleted from the flag by the order of General Abul Manzur, most likely to simplify the design. A red disc is on top of the green field, offset slightly toward the hoist so that it appears centred when the flag is flying. The red disc represents the sun rising over Bengal, and also the blood of those who died for the independence of Bangladesh. The green field stands for the lushness of the land of Bangladesh. The red disc is a socialist symbol of the rising Sun of independence after the dark night of a blood-drenched struggle against Pakistan. The original flag was designed by painter Quamrul Hassan. On 2 March 1971, the initial version of the flag was hoisted in Bangladesh for the first time at the Dhaka University. As the Vice President of Dhaka University Students’ Union (DUCSU), student leader A. S. M. Abdur Rab hoisted the flag. On the declaration of Independence on 26 March 1971, Sheikh Mujibur Rahman flew the flag in his residence. The flag was conceived so as to exclude the crescent and the star considered as symbols of West Pakistan. According to Flags of the World, the green used in the flag does not represent the traditional colours of Islam, contrary to some western sources (such as the CIA World Fact Book). Rather, the green colour was chosen to represent the lushness of the natural landscape of Bangladesh. The current flag resembles the flag of Japan with the background a different colour. The map was removed from the flag in 1972. One reason given was the difficulty rendering the map correctly on both sides of the flag. In the World Flag this flag has important design balance and appears center right of the earth image. See World Flag Symbolism and History post. The World Flag to Attend Seattle Green Festival! We are proud to be attending Green Festival Seattle this June 5th and 6th. Another amazing line up of speakers and exhibitors, this years Green Festival looks to be more inspiring then ever. Amy Goodman of Democracy Now, Deepak Chopra, Lester Brown, president of Earth Policy Institute and many more. Be sure to check us out at Booth # 729 and learn about cultural diversity and how you can be a part of the solution. Green Festivals are a joint project of Global Exchange and Green America where you can discover some of the best green products and services the Northwest has to offer. And through Seattle Climate Action Now!, Clean & Green Seattle and the city’s many other climate projects, you’ll learn how neighbors, community nonprofits and city departments are working together to make their city a healthier place to live. Leading up to Seattle Green Festival is Green Week, May 28 to June 6—a week-long series of (mostly free) city-wide activities focusing on Seattle’s “green” movement, from hands-on organic gardening, to water-testing, to film screenings on sustainability. Participate in any of these events and receive a free one-day pass to Green Festival! Tiokasin Ghosthorse, host and producer of First Voices Indigenous Radio, NYC, brought a 3×5′ World Flag to the UN General Assembly to display during his speech on the rights of indigenous peoples. As an inspirational speaker and one who understands the power of symbols and words, his connection to The World Flag happened at a chance meeting during the San Francisco Green Festival. Tiokasin was hoping to display the flag during his speech but it had not been “cleared” and was considered “political” by the United Nations. It is no surprise that the UN would not allow The World Flag to be displayed. By it’s very nature and design, the UN may very well be the most political organization in existence. There is a very delicate balance which occurs when you assemble dignitaries, ambassadors, and world leaders from many countries to discuss rather somber world issues. The etiquette of flags and where and how to hang the flags of countries in close proximity to each other becomes a balancing act of diplomacy, decorum, and respect. Each country has a sense of pride and honor, in a sense a clinging to it’s own collective ego. The World Flag is about breaking down the barriers between countries and eliminating the false boundaries created by the governments of the world. It is a symbol for the people of the world, having nothing to do with politics, or governments. The essence of The World Flag is Teaching Unity in Matters of Global Concern, so that all people of the world realize that the major challenges facing each of us; scarcity of clean drinking water, human rights abuses, environmental degradation, scarcity of food resources, access to education, etc, are issues that affect all of us. These issues no longer exist in isolation as the world becomes more and more connected and interdependent. 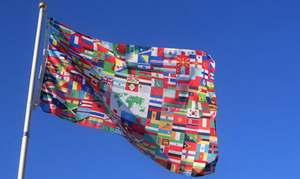 The World Flag is also about sharing and celebrating cultural diversity. The colorful aspects of each countries’ unique culture; it’s history, food, dance, language and customs are to be celebrated and enjoyed. Sharing what makes us unique and opening our eyes to new ways of being in the world, new ways of seeing each other, will allow us to work together to meet the challenges facing us all. Even though not the intention, by it’s very nature the United Nations operates from a place of strongly delineated separation, where each countries separateness is naturally reinforced by the voting processes and organizational structure. The original idea of a United Nations is certainly of noble intention. The extraordinary accomplishments it has achieved in the past 65 years are nothing short of astonishing. But has the UN achieved a true sense of connectedness amongst the countries of the world? Has cooperation transcended politics in matters of global concern? Is it not time for the UN to fly The World Flag and embrace what the people of the world already know? That this is our shared planet, this is our shared world. NEW YORK, Apr. 16 /CSRwire/ – Tiokasin Ghosthorse will display The World Flag as he speaks to the General assembly of the UN during the 9th session of the UN Permanent Forum on Indigenous Issues this Monday April 19th. Nearly 2,000 indigenous representatives from all over the world will gather at United Nations Headquarters in New York on Monday for the start of a two-week meeting aimed at ensuring their full participation in development while preserving their culture and identity. At the meeting, the ninth session of the UN Permanent Forum on Indigenous Issues, they and Member States, UN agencies and civil society groups will discuss efforts to guarantee to indigenous peoples their full and effective participation in development processes, including thorough consultation in establishing development programmes and policies. Secretary-General Ban Ki-moon will address the opening session in the General Assembly Hall. Key issues to be addressed during the Forum also include indigenous peoples in North America, and indigenous peoples and forests. The session on North America will aim to identify both the challenges faced by indigenous peoples in the region, as well as positive measures of cooperation that can contribute to improvements in their situation. On the issue of peoples and forests, the Forum noted that policies that treat woodlands as empty areas available for development often force indigenous peoples out of their homes. In addition, some conservation schemes establish wilderness reserves that deny forest-dwellers their rights. “Development policies that take into account indigenous peoples’ culture and identity can be beneficial not only to indigenous peoples, but also for Member States and developing countries in particular,” it said. The Forum, set up by the UN Economic and Social Council (ECOSOC) in 2000, provides expert advice and recommendations on indigenous issues to UN agencies, raises awareness and promotes the integration and coordination of relevant activities within the world body. It comprises 16 independent experts appointed by ECOSOC, eight of whom are nominated by governments and eight by indigenous organizations in their regions.